Vegetarian burgers, while still deemed oxymoronic by the meat-loving masses, have come a long way since the patties first found their way to commercial markets about two decades ago, when what had previously been “hippie food” sidestepped into the mainstream. And yet, most sit-down burger joints have just one version (if any) available, and only one national fast-food burger chain offers them (tip of the crown to Burger King). But plant-based diets (the new cool way to say “vegan”) are rising in popularity and diners are increasing familiar with meat alternatives such as tofu, tempeh and seitan. Enter the vegan burger joint. Still an up-and-comer, they seem to be popping up in odd locations: Singapore, Winnipeg, San Antonio, South Florida. And now, Bend. 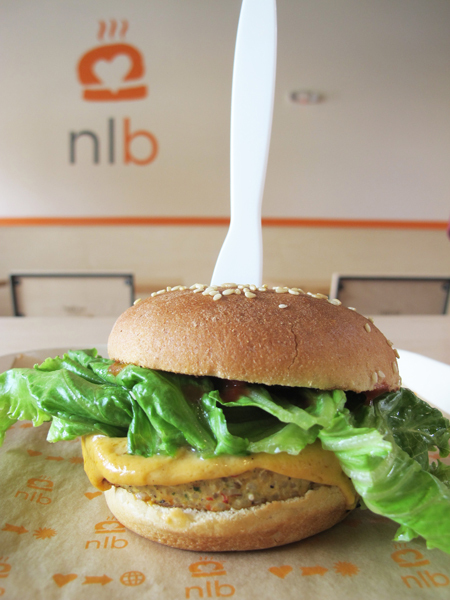 Next Level Burger (NLB)—a plant-based burger joint with the cheeky tagline “Love Your Buns”—is the most recent restaurant to bank on Bend’s growing fondness for all things healthy and locally-sourced. It takes that desire for clean fuel and cleverly combines it with beer and burger culture. The meat-eating members of the Source‘s Eating Team were initially confused and disoriented. Meanwhile, the sole vegetarian member (me) was in a type of heaven. Most burger joints offer at most one option for non-meat eaters. The idea of choosing from among NLB’s eight (eight!) varieties of veggie burgers was mind-boggling. In fact, this concept was so difficult to absorb that we initially misread the menu, and assumed that the “meaty” options were actually meat. As such, our meat-eating reviewers ordered the Next Level Burger and the Special Sauce Burger—both “meaty” varieties. I ordered the Quinoa Burger and we brought a SoCal burger back for an office mate. Other options included a tempeh burger and a sausage burger. We also sprang for a side of fries and a Hot Cakes Caramel shake. Our food was served on individual cafeteria-style trays made from recycled materials and everything on them, we were told, is compostable. Though NLB offers local beer (from nearby Good Life and from Portland-based HUB), cider and kombucha on-tap as well as a variety of craft fountain sodas, we opted for lemon water. Though, with burgers in the $6.50-$8 range, there’s room in the budget for extras. The burgers were perfectly stacked and assembled similar to a Crabby Patty, the glowing example of a hamburger on Sponge Bob Square Pants. Editor Phil Busse said the NLB Burger—their standard burger—has a surprisingly plump patty and a clean taste, with classic sesame seed-sprinkled buns. Music editor Bri Brey said the Special Sauce (leave G-LOVE out of this) was a standard soy-based patty attempting to resemble meat (meaning it was flavorful but a little rubbery) slathered in a semi-spicy mayonnaise-style NLB sauce. A messy eat to be sure, the burger was great, especially surprisingly so considering Bri’s favorite food is bacon. Real bacon. The bun was perfectly toasted and the fries were crispy dipped in Annie’s organic ketchup…none of that Heinz crap. However, it was the non-“meaty” versions that won the day. As is often the case, the veggie burgers that didn’t try to be something they weren’t were the tastiest. Though Bri’s curiosity was sufficiently piqued by the burger that she is now tempted to try a vegetarian hotdog and, of course, the non-meat bacon, if only so she can be incredibly satisfied when she return to the “real” animal product. As the team’s sole vegetarian, I opted for the quinoa and black chia seed burger. Like the others, it was impressively round. Firm, tender and chewy, it had a pleasing if mild flavor. The burger’s decidedly healthy taste (like most things, it would have been delicious fried) grew on me over the course of the meal, to the point that I contemplated ordering another. But the shining star may have been the shake. A sugary tornado of caramel and vanilla, the clean tapioca and coconut flavors replaced the thick dairy creaminess of other milkshakes. It was indulgent without being heavy or sickly sweet. Though we didn’t try them, we were intrigued by the kale-heavy salad selection, abundant sides (from chili cheese fries to tomato soup), sandwiches, fresh-squeezed juices and kids’ menu. In all, NLB is a welcome addition to the Century Center, which despite housing GoodLife Brewery and its small food menu, Volcano Vineyards Wine Shop, Volcanic Theatre Pub and Backporch Coffee, was distinctly lacking in substantial food options. And for Bend, which was in sore need of a plant-based joint where veggie-eaters can break bread with their meat-loving friends without breaking the bank.